Posted on October 31, 2017 October 31, 2017 . by Patrick Johnstone. 2 Comments. We are one year from voting in local elections, and based on increased activity in the local blogosphere and a perceptible sharpening of local social media jabs, we can safely assume the silly season has begun. The more serious campaign news this week is that the provincial government has provided a heads-up on how to organize our 2018 campaigns. We knew there were going to be spending limits, but it is good to have some certainty on the ending of Corporate and Organized Labour donations. New campaign spending limits based on the voting population were established early this year with amendments to the Local Elections Campaign Financing Act. In 2018 New Westminster, Mayoral candidates will be limited to about $45,000, and Councillors to about $23,000. After some speculation, and more than a little uncertainty, the provincial government introduced yesterday proposed legislation to ban donations to local election campaigns by Corporations and Labour Unions. 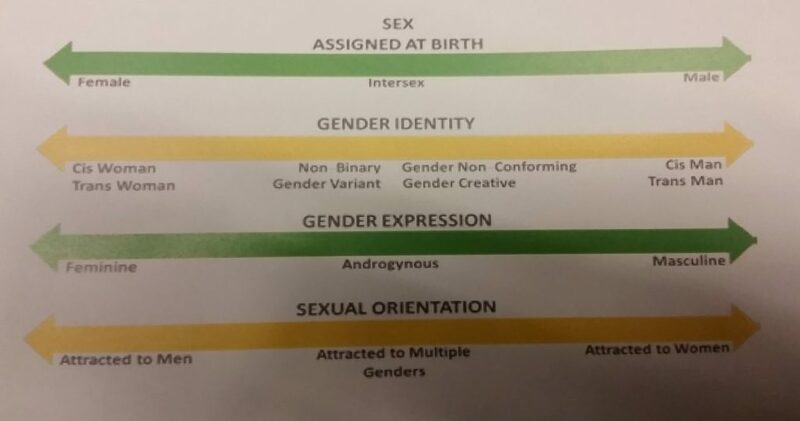 It is safe to assume that the Green Party will support the legislation (it is something they have called for), so we can now say the playing field for the next election is set. To get an idea what this means in New West, you can look at how money was raised last election. The data is available at the Elections BC site where financial disclosure forms for 2014 are still posted. 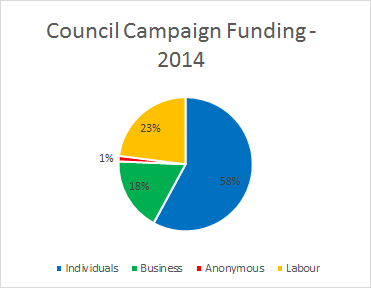 However, the main candidates did vary quite a bit in how they raised their funds. 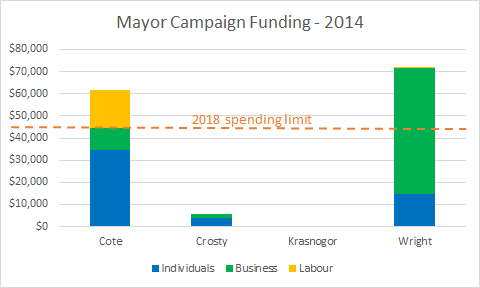 Candidate Cote, by far, collected the most from individual donations in 2014 (twice that of all other candidates), and received the bulk of available labour support (though only a little more than ¼ of his funding). 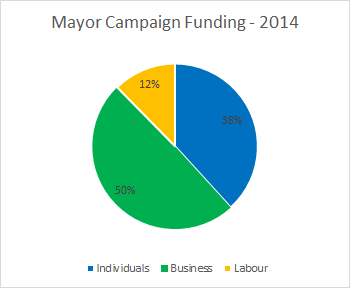 In contrast, Mayor Wright received most of the business support, and was in turn mostly supported by businesses. 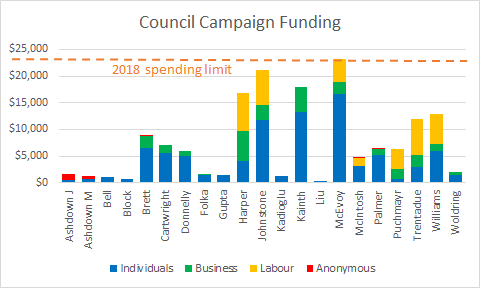 Both main candidates spent more in 2014 than will be allowed in 2018, and neither collected enough from individuals to meet the proposed maximum spending amount. Although the ranking of overall spending closely parallels that of fundraising from individuals, there is no doubt that the gap between the biggest and lowest spenders was widened by business and labour contributions. Based on that trend, it is probably safe to assume that the removal of so-called “big money” from local elections will result in more equality in campaign fundraising/spending. This is a good thing. My equivocation is part of the reason why I haven’t taken a vocal side in the “Ban Big Money” rhetoric. I absolutely think it is a good thing in the long run for democracy, however I was elected under the old system, and received the benefit of business and labour contributions. Now I have a potentially bigger advantage: incumbency. There is no doubt in council elections that incumbency is an advantage. One way to overcome that burned-in advantage is to raise more money and run the kind of super-organized and hit-all-the-bases campaign we all dream of running. It could be argued that having used a “big money advantage” to get a seat, my now campaigning to take that potential opportunity away from others is, well, self-serving. And that always made me feel a bit itchy about actively campaigning for this change. In the end, this is where we are for 2018, and I’m glad we all have lots of heads-up about what the rules are going to be. Game on. Posted on October 23, 2017 October 23, 2017 . by Patrick Johnstone. 2 Comments. On Saturday, local government elected types met in North Vancouver for a Council of Council meeting. 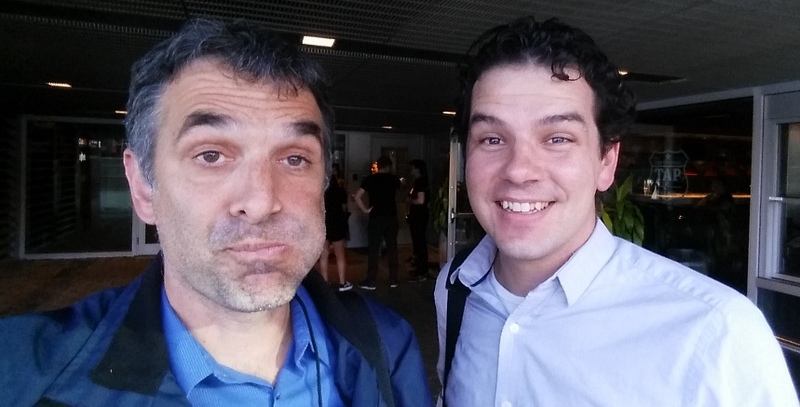 For a great write-up of what the meeting is and what we discussed, surf over to Nathan Pachal’s great South Fraser blog. I want to talk about another conversation that came out of the CofC. I had an afternoon meeting for the Lower Mainland LGA, and side-bar conversations with a few of the Councillors continued on this theme, partly because some members of LMLGA are working on an event to discuss the general lack of “civility” in civic politics, and how that creates barriers to full participation. The story of Mayor Read of Maple Ridge announcing she will not stand for a second term was also fresh in our minds. It would be puerile to assume these issues are not interconnected. But it go us to talking about the why. Is it the electorate not voting for diversity, or is there something structural in the job that prevents diversity? That seems like something that should be easy to figure out. For Council, 33% of candidates were women, and 38% of those elected were women. For Mayor, 16% of candidates were women, and 16% of the winners were women. Perhaps more tellingly, there was a woman on the mayoral ballot in only 7 of 19 communities (three were elected). As a first-level approximation, we can suggest that voters, when given the opportunity, vote for women at least as commonly as for men. However, there are half as many women running for Council, and a paltry one-in-six mayoral candidates are women. If it isn’t the voter’s fault that local government is so dominated by men, what is it about the job that so biases those who apply for the job? I have my own suspicions, but maybe I’m not the right person to answer that question? Unfortunately, there is absolutely no data collected on whether candidates identify as persons of colour, members of a First Nation, or have disabilities. It is harder to tell if it is the voters that account for the shade of the average Council of Council room. 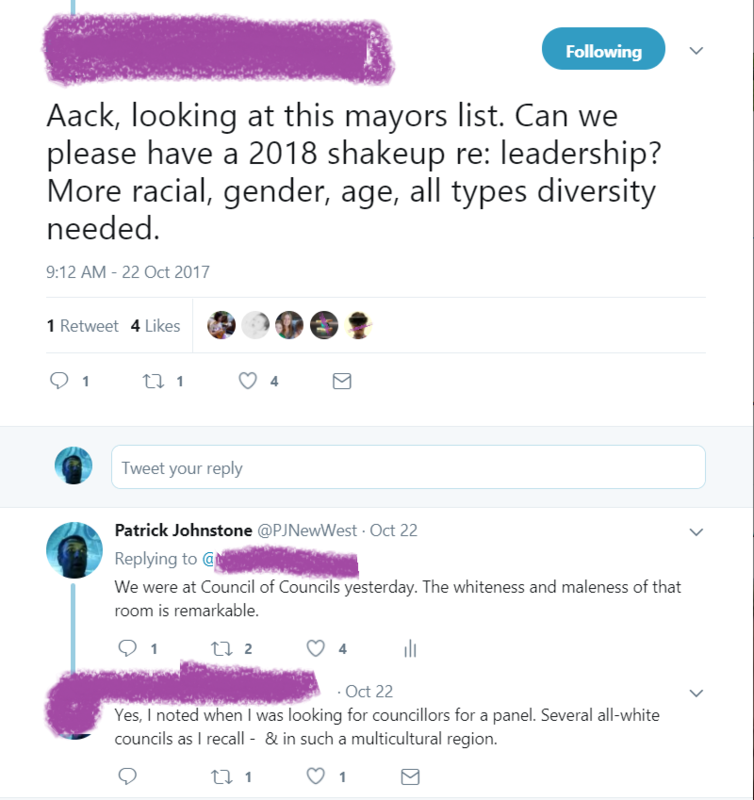 I should note that it was pointed out to me recently (through a letter to Mayor and Council) that there is a general a lack of diversity in our Council Advisory Committees, and that the City does not appear to be taking any specific actions towards increasing that diversity (hey, apply for a committee now!). It is also recognized that the current Public Consultation and Public Hearing model is dominated by, well, the dominant demographic. I don’t have the answers here, but strongly feel we need to broaden public participation at the community level first if we are going to see more diversity in elected roles. Unless we do, it is hard to call our society “democratic”. Posted on October 18, 2017 . by Patrick Johnstone. 2 Comments. Aside from the actual human drama, we had some work to do at Council on Monday, and a pretty detailed Agenda. This is a high-rise mixed-use development project in the part of Downtown designated as the Tower Precinct. The building would be 33 stories high with 253 units, including a mix of Townhouse and two- and three-bedroom units that exceed the City’s Family Friendly housing policy. Part of it would be built over the SkyTrain line where it emerges from under Sixth Street, and ground-based retail on the Sixth Street side would include a public “parklet” area. A thin strip of the Clarkson Street road allowance would have to be transferred in order to build the encapsulation of the tracks. This project has been in the works for some, and has been through neighbourhood open houses, Design Panel, Residents Association and APC review. 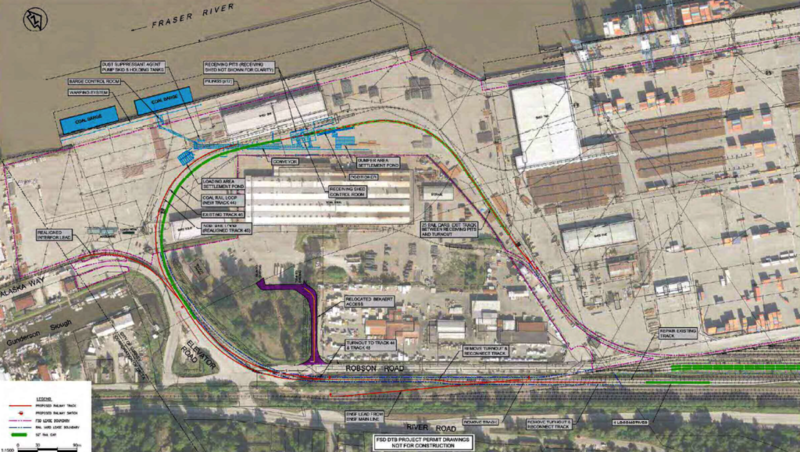 The required Zoning Amendment will require a Public Hearing, the date of which will be set once design approval from TransLink for the SkyTrain encapsulation is received. I’ll reserve my comments until after the Public Hearing. There are some staffing changes coming in our Finance Department, and the role of “Chief Financial Officer” has some regulatory duties, meaning they can do certain things like sign regulatory documents for the City. We need to make sure this authority is well defined and an actual person who works for the City has this authority during the anticipated transitions. Hence, this temporary designation. When the Mayor is out of town or otherwise occupied, someone has to be able to sign documents, declare emergency, or operate the weather machine on behalf of His Worship. The rest of council shares this responsibility evenly, taking two months each every year. Once again, I’m in for March and August. Get your weather requests in early. People applied for the Youth Advisory Committee, and we let them in! First meeting is next week! As Council Representative to the YAC, I look forward to another year of feeling old and uncool, but being inspired by the youth that get involved in this City. These are two Council Advisory Committee positions that are filled by other organizations, as they send member to represent their organization at the committee. Council still needs to approve them, though, so we did. Every year we adjust Parks and Recreation fees to keep up with inflation, changes in program costs, or to keep in line with what other cities are doing. Most of these changes are small, except the fees for groups using natural turf fields. We have not been charging while the surrounding cities have, meaning most users are now groups from other cities avoiding local fees. This fee increase better reflects the cost of maintaining grass fields, and should result in more equitable use of City resources. Council moved ot give the new Fee Schedule Bylaw three readings. Unless I miss my guess, this is the high-rise building application for Uptown since the Viceroy was approved back in 2011. Early days yet for this application (this is only a preliminary report), and much Public Consultation to come as it works its way towards a potential Public Hearing. So I’ll save my comments until it moves through the process. These are two side-by-side (but unrelated) projects on the edge of Queens Park. Both houses are protected under the Heritage Conservation Area, but the owners are suggesting adding higher protection (through Heritage Restoration Plans and Designation) in exchange for some variances to allow laneway homes. Again, preliminary reports, Public Hearings to come, so I’ll hold my comments until the public has a chance to chew on the projects a bit. The business planning to re-activate the old CPR station at the foot of Eighth Street wishes to run a food primary (restaurant) on the main floor, with a smaller liquor primary (pub/lounge) on the top floor. This will require a Zoning Amendment. That requires a Public Hearing which will happen on November 27th. Council moved to approve the DP for this small affordable housing project in Queesnborough. It will be a five unit townhouse development on land owned by the City, but leased to a not-for-profit operator called Women in Need Gaining Strength (WINGS). This project will provide independent family housing that will be affordable and designed for single mothers and their children, in support of WINGS’ mandate. I’m happy the City can help make this project a reality and do a little part to fill a huge need in our region. The semi-demolished Gas Works building needs to be removed from the City’s Heritage Registry, so it can be demolished the rest of the way and the province can get on with cleaning up the site. It was one of the oldest industrial buildings in BC, but the combination of decades of neglect and extensive heavy metal contamination make restoration and preservation prohibitive. We may have had a chance to save the Gas Works, but it probably had to happen more than 20 years ago. After the Heritage Conservation Area was adopted by Council, there are a bunch of tasks we left on staff’s table, this report provides a timeline and strategy to get those tasks done. This includes amending the maintenance standards bylaw (to prevent demolition-by-neglect), development of incentive packages to both boost conservation and to allow infill density where appropriate, and evaluating specific approaches for “Special Limited” houses – smaller houses on smaller lots where the standards suite of incentives may not be applicable. Council approved a 2-year multi-phase work plan, and reiterated our commitment to a formal public Policy Review two years after implementation. This is a hangover from the protracted drought we had two summers ago, and a public delegation we had asking the City to do more on the water conservation front. Although we had a pretty low-stress summer season this year, never moving past Stage 1 water restrictions, the City is moving forward on a few fronts. There will be more enforcement of lawn watering restrictions, there will be some new incentives for those installing water-conservation measures in their home, and the City will be ramping up audits of water efficiency in our own buildings. The business case for universal metering is not well supported (most of our water is already metered, and the cost of implementing for the other 30% is challenging – potentially raising rates for everyone), however, Staff is going to do some more work on this, including doing some data collection on meter-ready houses that are currently charged flat rates, so we can better understand a rate structure we would need to implement if we go that way. That said, Metro Vancouver’s water utility is doing a study right now, and will be providing a report in the spring of 2018 on universal metering – although it is not certain yet if they will mandate it, or how they envision it working. The work being done by staff right now will hopefully dovetail well into that study. As much as we can, we are getting ready for what we don’t know is coming! The City set the goal in 2008 to reduce out GHG emissions to 15% below 2007 levels by 2017. Until this year, it looked like we were on track. Now, it looks like we are going to miss the target. Our buildings, lighting, and utility GHG emissions are all on or ahead target, but out vehicle fleet has suddenly fallen behind. The short-term spike we see in fleet emissions that is so challenging our target can be blamed on changes to our solid waste fleet and the extraordinary efforts put in for snow management and removal due to last year’s horrible winter. However, that is more the obvious symptom that the root cause – we are simply not shifting our fleet over to lower-carbon or zero-carbon vehicles fast enough. The technology is shifting fast, from biodiesel to electric vehicles, even for heavier vehicles, but the capital required for us to catch up and replace our fleet is obviously a challenge. 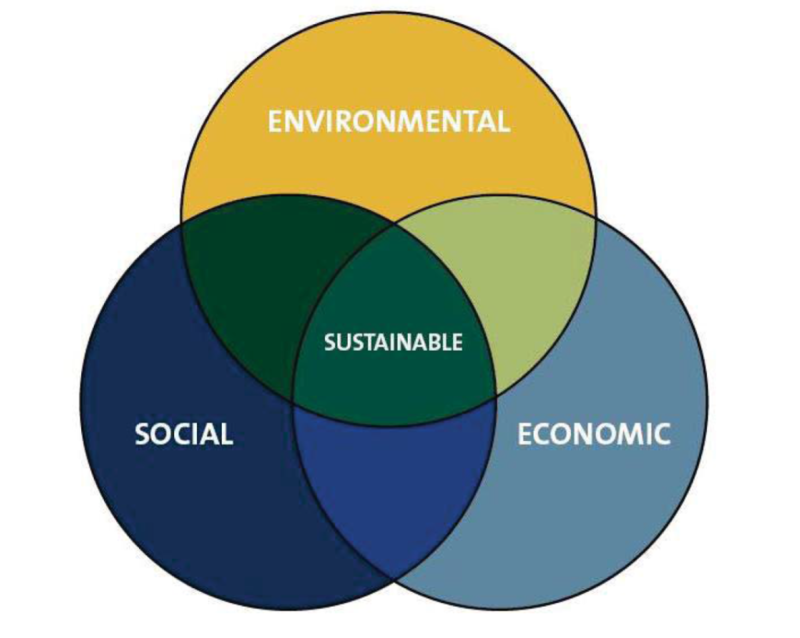 As we are approaching the end of our 10-year GHG plan, it is time for us to start planning for decade ahead. 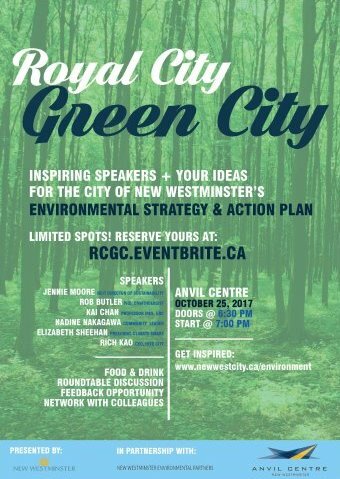 Our goals should be based on doing our part towards the nation’s Paris Agreement commitments, although as a built-out compact urban community, a City like New Westminster arguably has to do more than the “average” for local governments. We are going to start by reviewing our Fleet policy, as the 2011 one is clearly missing the mark. The old La Rustica restaurant has been boarded up for a couple of years, but it is a challenging site to develop, with some proximity issues on the lot and grade concerns. A new design team is now taking another shot at the design. Again, this project will be going through consultations and a Public Hearing before any final approvals are given, so I’ll save my comments until then. Aging out of care is one the leading causes of homelessness in British Columbia. Few of us can understand the pressures of transitioning to adulthood at the same time that your family and community supports are cut off. It is a trap that is hard to escape, except for the hard work of a few support agencies that do their best to provide housing and guidance at that critical time. Turns out or zoning makes it difficult for agencies like this operate in our community. Staff have identified this barrier and provided us a pathway to amend our zoning to allow them there organizations to work legally in our City. Council moved to give this amendment first and second reading, and a Public Hearing will happen on November 27. This Bylaw to support the development of a mixed-use highrise in Downtown, as described above, was given two readings. The date of the Public Hearing has not yet been set, as the proponent needs to work with TransLink over the SkyTrain track enclosure. This Bylaw to support the operation of a restaurant and pub in the old CPR Station, as described above, was given two readings. The Public Hearing will be on November 27th. C’mon out and tell us what you think. This Bylaw permits the closure and sale of a narrow piece of Clarkson Street adjacent to the SkyTrain line to allow an encapsulation of the tracks. It was given Three Readings. 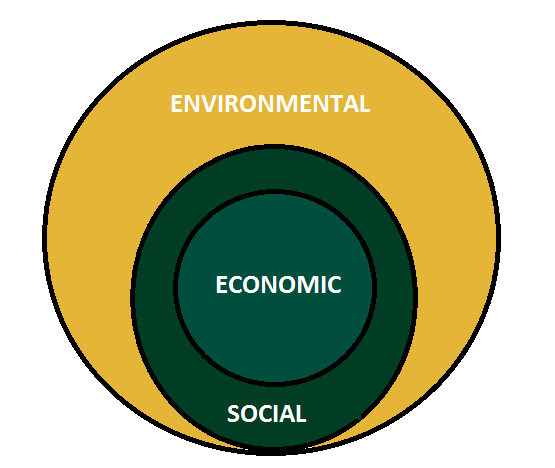 The Bylaw supporting the annual rate adjustment for Parks and Recreation facilities and programs (as described above) was given three readings. This Bylaw to amend our zoning Bylaw and facilitate aging-out-of-care supports in our community (as described above) was given two readings. The Public Hearing will be on November 27th. C’mon out and tell us what you think. This Bylaw to support the development of an Affordable Housing project at the east end of Downtown was Adopted. I’m really glad to see this moving forward with support of the community. This Bylaw formalizing our list of property tax exempted properties was adopted. Finally, reflecting the joy and sadness of the day, we had an emotional rollercoaster of an Open Delegation session. Some inspirational ideas, some challenging questions, and some pretty inappropriate comments by people who probably don’t know better. Altogether, it was an emotional night for many of us, and I can’t say I went home in a good mood. Lots of work to do.